Let’s track what’s really important in your farming operation! More and more companies offer you the ability to receive weather-based notifications. It’s also easy to receive target price notifications on whatever futures contract you’d like. We’re taking this to the next level. 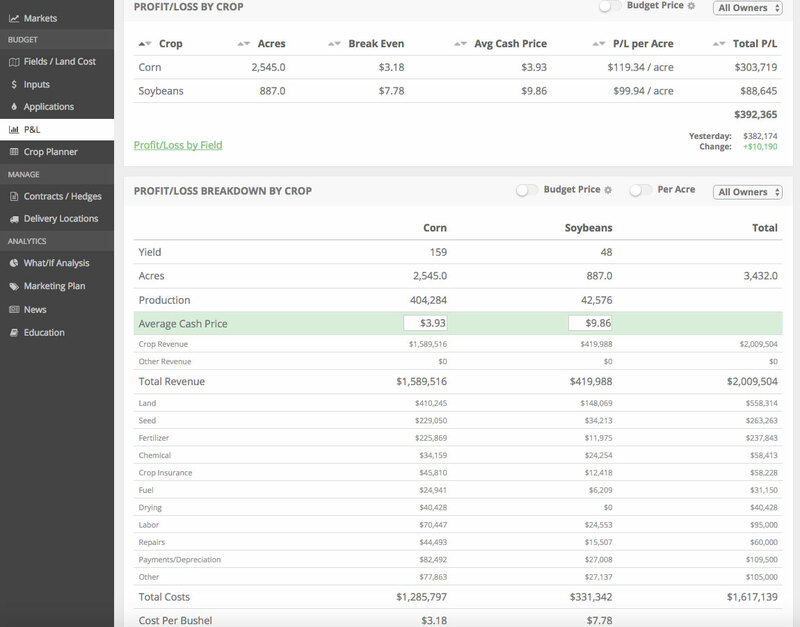 These are notifications are based on your farm’s cost structure (variable and overhead), current grain sales, local basis levels, and minute-by-minute futures price changes. While you’re focused on growing the best crops you can, we’re focused on helping you grow and protect your bottom line. Many Ag Tech companies are trying to use technology to help you craft the perfect seed/fertilizer/chemical presription. The goal of maximizing yields is a key ingredient to farming success but we need to do it with a focus on the bottom line. While much of the current yield-focused Ag Tech is definitely valuable, it’s our mission to help farmers with the “Business of Farming”. We’re working hard to help our users make more profitable and less emotional farm business decisions while using the best-of-breed technologies they expect. Furthermore, we’re 100% employee-owned and customer-funded so our sole goal is helping our users maximize their investment in our platform. If are users don’t succeed, we won’t succeed. How can we help your operation? Email us any time with questions/comments/suggestions: support at harvestprofit.com. We’d love to hear from you. Also, if you’d like to jump into a live test account click the button below.